Just over 100 years ago on November 10, 1918 a small group of Manor and Highland Park residents, veterans, and serving personnel got together and held the first service of Remembrance at the Church of the Epiphany on the corner of Holborn Ave and Briscoe Street. It is important to note that this first service took place one day before the armistice that ended the Great War. Epiphany has always been a leader in recognizing the contributions of our armed services. For the first few years a large wooden cross took the place of the cenotaph which now stands on church property. The original cenotaph was dedicated on May 31st, 1925. ceremony. It is important to note that the Manor Park cenotaph preceded the downtown memorial by 9 years. Every year since 1918 a service of Remembrance has been held here at the Church of the Epiphany. Recently the service has been moved to the last Saturday in October so as to not conflict with the main Remembrance Day service at the downtown cenotaph. On November 10, 1918 (the day before the armistice ending the Great War) a Service of Remembrance was held in front of a large wooden cross on the lawn of the Church of the Epiphany. The cross was used for several years until the residents of Manor and Highland Park replaced it with a cenotaph (empty tomb) as tribute to those Canadians who fell in World War 1. 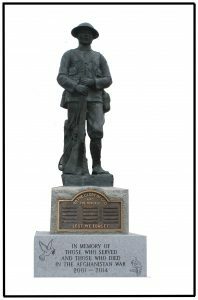 A bronze plaque was affixed on the base at the front under the Italian Marble Statue of a soldier (one of only 8 produced). The statue was produced in Italy and shipped to Manor Park Canada. Cost of the cenotaph was $8,000 in 1925 ($114,000 in today’s 2018 dollars). The plaque was engraved with the names of 15 local soldiers who never returned. The Manor and Highland Park cenotaph was officially dedicated on May 31st, 1925. Over 2500 people attended that first dedication. It was the first cenotaph in the city of London, preceding the downtown memorial by 9 years. In his remarks at the dedication service, Mayor George Albert Wenige of London said, “Congratulations to residents of this community. Especially since London itself has not managed to erect a monument since the Boer War. (1899).” Mayor Wenige suggested that the people of Manor and Highland Park should show the rest of London how to do it. Over the years bronze plaques were added to the cenotaph. The first was to honour those who served and those who died in World War II. A third bronze plaque was added to honour those who served and those who died in the Korea conflict. The cenotaph was rededicated in 1985 after vandals desecrated and destroyed the marble statue. A bronze WW1 soldier replaced the vandalized original sculpture. Cost of the reconstruction was $20-25,000 ($47-53,000 in today’s dollars). On Saturday, October 27, 2018, our cenotaph was dedicated a third time. A new granite block was engraved and installed in honour of the more than 40,000 Canadian Armed Forces personnel who served and the 159 who died in the Afghanistan War. The official unveiling was done by Carolyn Wilson our silver cross mother and her husband Carl. Mayor Elect Ed Holder was the Honourary Reviewing Officer for the dedication service which was the 101st service of remembrance to take place at this site.